Keeping mail on a local machine does not make sense when working across a large number of different (vitual) devices. As a GoogleApps user I have long preferred browser based mail client as my default. Unfortunately this is not yet a very straight process on most Operating Systems and Ubuntu is no difference. 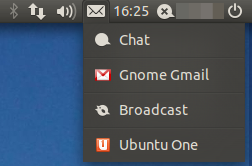 Log out for the changes to the indicator to take effect (or kill gnome-indicator process).